MODEL FLYING HAWKES BAY (MFHB) has had numerous flying sites over the years thanks to the help of the local farming community and other interested groups and Aeromodelling enthusiasts in The Hawke's Bay were encouraged over 70 years ago to form a group to promote the many types of aeromodelling activities available.The first club in the district was The Hastings Model Aeroplane Club followed by a similar group in Napier. Subsequently The Hawkes Bay Radio Flyers Inc. Was established from members of both groups to form a solid base for the future of the sport in the Hawke's Bay and District. In 1992 the club was introduced to its present flying site by The Hawke's Bay Regional Council, this is a splendid facility at Awatoto, off Waitangi Road, beside the Fertilizer Works just 6 kms South of Napier City. We also have an alternative electric site at the ROYS HILL RESERVE and Slope soaring is flown from Ocean Beach and also South of Hastings at the top of Burma Road off the Te Hauke strait. As in the past we endeavour to give full report coverage on events such as "WARBIRDS OVER AWATOTO", and associated rallies and competition events, together with feature articles and member announcements not covered by the newsletters. These features will all be accessable from the accompanying menus, and there will be a continually updated calendar of club and associated events. Recently we have established a Weather Station at Awatoto Field, and this loads automatically at the bottom of this page. Your input, comments, opinions and news are always welcome, and can be sent to "Brett the Editor" by clicking HERE. Please also have a look at our Current Newsletter and enjoy the content. 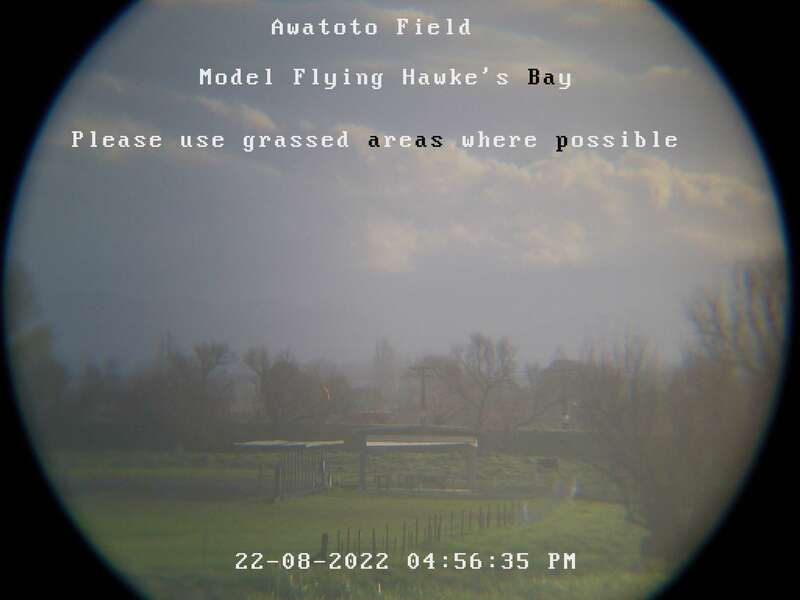 The weather station below offers real time information on conditions at Awatoto Field and the webcam refreshes every five minutes to give a view of the pits and carpark at the field. Club Newsletter #104 now uploaded and available to read. 12/04/19 - More For Sale items added. 03/04/19 - Duck Shooting notice added. 16/03/19 - Upcoming events added. 25/02/19 - Club BBQ date added. 06/02/19 - New For Sale content added. 31/12/18 - Club News Updated. On the field content added. Field and Shed pages - new content added. 10/12//18 - Vintage Page content added. 02/12/18 - Xmas party notice & link added. 25/11/18 - November IMAC event removed. 20/11/18 - For Sale page added. ● Duck Shooting Field Closure. ● Also... Vintage Flying every Thursday morning at the field - weather permitting!